The adaptation of a novel into a stage play is as delicate a proposition as the spinning of a spider’s web. Novels written in the first person may not be as dialogue-driven as those of Jane Austen, requiring a reach into other perspectives to find the words. Those who strive to create an ethos as much as tell a story may create challenges by their lack of linearity. And those written for a specific readership may be difficult to turn into a theater piece for a larger audience. 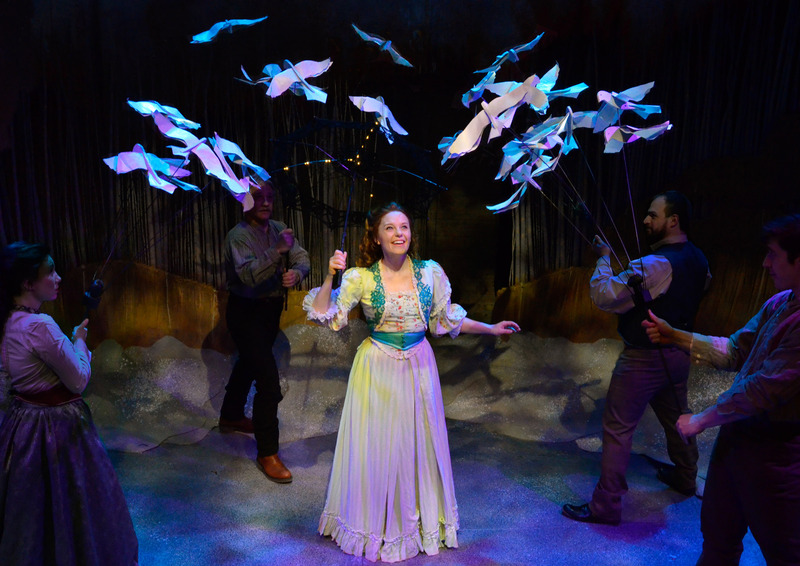 Chicago has come to depend upon Lifeline Theatre to find the right material, and to use their expertise to assist the adaptor in illuminating a story and its characters in a completely new language. Unfortunately, Jessica Wright Buha’s adaptation of novelist Amy Timberlake’s “One Came Home,” directed by Elise Kauzlaric in this world premiere, falls short of the goal. Word-echoing that at first warms, particularly when traded between characters and in different situations, becomes annoying before the end of the first act. While giving dead characters the opportunity to contribute ghostly revelations can be cathartic, to show people who are not dead as ghosts is to tell a lie for which an audience may not be forgiving. The elongated road trip, with the parallel journeys of solving a mystery and coming of age, prevent the story from achieving a steady climb toward an apex. Exactly which girl was killed, wearing which dress, why, and by whom? Alan Donahue’s set is both evocative and expedient. John Szymanski’s original, folksy music is appropriate, and mostly well executed; the transparency of this style of music will sound every crack. Ashley Darger’s protagonist spends the entire show onstage; a charming, open and giving actor, she is one to watch. As the heartthrob, Jeff Kurysz shows great depth and an easy, much needed comedic sensibility. Lifeline Theatre, 6912 North Glenwood, (773)761-4477, lifelinetheatre.com. Through April 5.